"This powerful print is probably a memorial portrait. 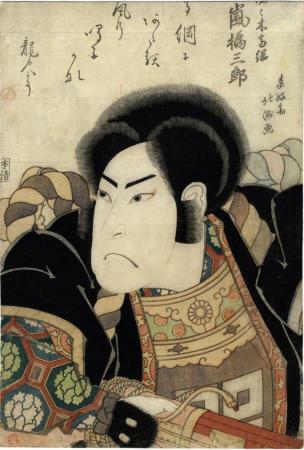 Like some of the other memorial prints of Kitsaburo it shows him in a role dating back several years. The legendary Sasaki Takatsuna is shown here with a gun, behind which his crest is visible on the breast-plate. This crest is called 'Yotsume', or four hollow squares. Takatsuna took a prominent part in the succesful campaign of Minamoto Noriyori against Kiso Yoshinaka in 1184." Quoted from Ōsaka Kagami 大阪鏡 by Jan van Doesburg, p. 26. Dean Schwaab noted that there is some confusion as to whether or not there was more than one edition of this print. Some have a blue ground, but he notes that the blue "usually disappears completely..."
Schwaab also notes that "This is one of the most splendid of Hokushu's portraits and is rarely found untrimmed and with color intact." He continued by saying that the one in his volume, Osaka Prints "...is the only impression I have seen retaining the fugitive pale-blue ground and the rose eye make-up." According to Andrew Gerstle in his Creating Celebrity: Poetry in Osaka Actor Surimono and Prints Arashi Rikan, aka Kitsusaburō I, was so offended by the crudeness and crassness of his chief rival, the Edoite Shikan, aka Nakamura Utaemon III, that he refused to permit poetry to be written on Osaka oban prints of his group - that is, until this image appeared. Shikan was a master of self-promotion and his arrival in Edo in ca. 1815 led to the development of oban-sized prints accompanied by texts, mainly poems. Rikan did not relent to do such a thing until 1821 when he change his name to Kitsusaburō I. Not only that, either through persuasion or based on the respect that other Osaka actors had for Rikan, they avoided poetic inscriptions on their prints too. "What might have caused Rikan to change his view and allow poems on ōban actor prints as in figure 11? Rikan’s passing on the name 'Kichisaburō' to his nephew, the son of his elder brother, and his creating the new stage name 'Kitsusaburō' in the first month of 1821 were decisive moves." 1) In Ōsaka Kagami 大阪鏡 by Jan van Doesburg, p. 26. 2) In Osaka Prints by Dean J. Schwaab, p. 79. 3) In Ikeda Bunko, Kamigata yakusha-e shūsei (Collected Kamigata Actor Prints) Volume 1, Ikeda Bunko Library, Osaka, 1997, no. 91. 4) In Schätze der Kamigata: Japanische Farbholzschnitte aus Osaka 1780-1880, MNHA (Musée national d'histoire et d'art Luxembourg), p. 137, #49.